Many of us spend a great deal of time, energy and money attempting to document that a particular ancestor of ours belonged to a particular tribe or ethnic group. We all get very excited when we find a family Bible or a diary of an ancestor that dates back two or three hundred years. Don’t you wish your ancestors had carried a passport which got stamped at every branching point of their intercontinental migration route as they trudged through prehistory? Actually they did. In some cases our genomes have recorded more than a hundred thousand years of travel. This travel is documented in the mitochondrial DNA of all of us. A separate and more detailed path is documented in the yDNA of men. Many call this anthropology. 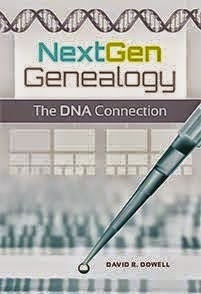 In Chapter 6 of my most recent book, NextGen Genealogy: The DNA Connection, I call this extreme genealogy. In either case it is the study of haplogroups – or the ancient clans to which our ancestors belonged. Women ancestors were somewhat limited in what they could communicate to distant descendants because our mitochondrial DNA (mtDNA) contains only 16,569 locations in which they can record the presence of one of the four chemical bases that make up our DNA. Their paths through prehistory can be traced for our female lines using mtDNA test results. mtDNA was the basis for Bryan Sykes’ pioneering Seven Daughters of Eve. Our men ancestors had tens of millions of additional locations where such information could be logged. What we look for today is where on our genomes these ySNPs occurred in this transcribed travel record. Once such a permanent change has occurred, it is passed down to all male descendants. What are ySNPs and how do they differ from the ySTRs we have been testing since 2000? Pronounced "stir." This is a repeating pattern of genetic code letters at a location on the genome. The value is the number of times that pattern is repeated at that location. Pronounced "snip." A single and permanent change in the DNA bases at a given location. Consumer DNA testing to discover family history information began in 2000 with the focus on the Y chromosome (yDNA) which only males possess. Mitochondrial DNA testing for both genders soon followed but is somewhat limited because it has ONLY 16,569 locations to store a single bit of information. By 2010 autosomal DNA testing burst on to the scene and has become the most popular test. By 2013 a new testing cycle for yDNA became available to genealogists. While the previous cycle had focused on testing ySTRs, the new wave examines ySNPs. However, yDNA can record 3,500 times the data that mtDNA can. Therefore, it has the power to record a much more detailed migratory history. 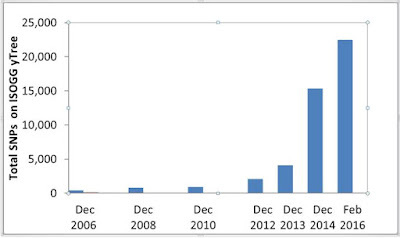 Most of yDNA testing to date has been conducted on Short Tandem Repeats (ySTRs). When we talk about 12, 25, 37, 67 and 111 marker tests, we are referring to how many ySTRs were tested. STR testing is analogous to dispatching a census taker to a village which is known to have 12, 25… residences. In our scenario the locations of these residences have been defined by geneticists as being accessible and having a rate of mutation that is somewhat predictable. At each location our census taker records how many STRs are currently in residence. In NextGen testing the focus shifts to Single Nucleotide Polymorphisms (SNPs). Instead of dispatching probes to specific, predefined locations, NextGen ySNP testing is more analogous to take satellite images along the entire Y-chromosome. Although the chromosome contains almost sixty million identifiable locations, current technology allows us to get reliable data from only about a fourth of those locations. Still this is an overwhelming amount of data. The computing power to analyze it has only recently become available. We are still working to find the exact location and sequence for many of them. In some ways our knowledge today would be like getting a SNP passport with several dozen “check point” stamps on it but in random order. We know that our genomes passed through all those points but are still trying to decipher in what sequence that journey occurred. 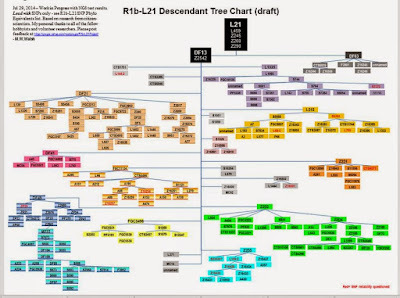 The charts above for R1b-L21 represent ySNPs that we have been able to arrange in evolutional order. As more men are tested and we can document where they exited the main SNP trail, we can refine our chronology for all of us. 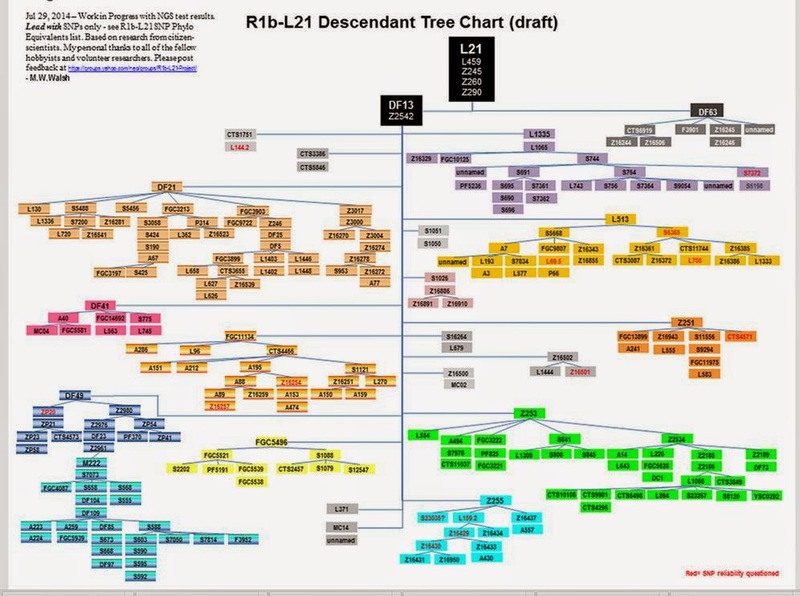 The chart below for sub-clade R-1026 is an expansion of the seven pale pink SNPs clustered at the bottom of the chart above. This subclade was unknown when the previous chart was drawn in 2013. Even with this deluge there are many more thousands of SNPs to come. The NextGen curve is where the ySTR was in 2003 when 10,000 tests had been sold by FTDNA. Ironically, that is the number of BIG Y tests Bennett Greenspan reports FTDNA has sold to date. 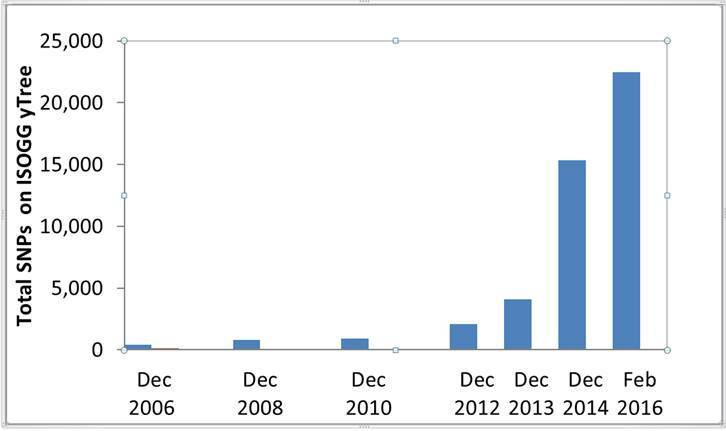 Full Genomes report their company has sold 1,500 NextGen tests. Most of the ySNPs that have been discovered have yet to be specifically placed and more will be discovered as testing numbers increase. 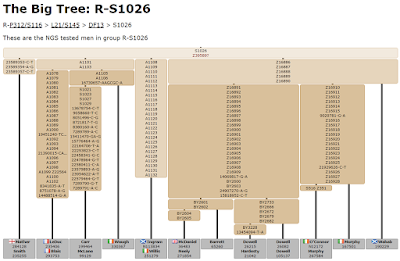 The entire recently discovered R-S1026 haplogroup above is not yet integrated into the ISOGG ytree. 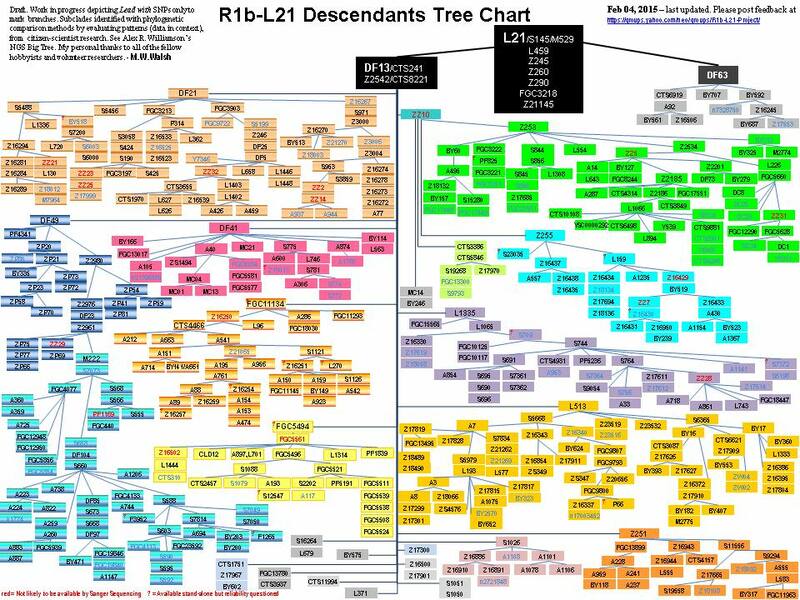 It is only partially integrated into the FTDNA ytree. 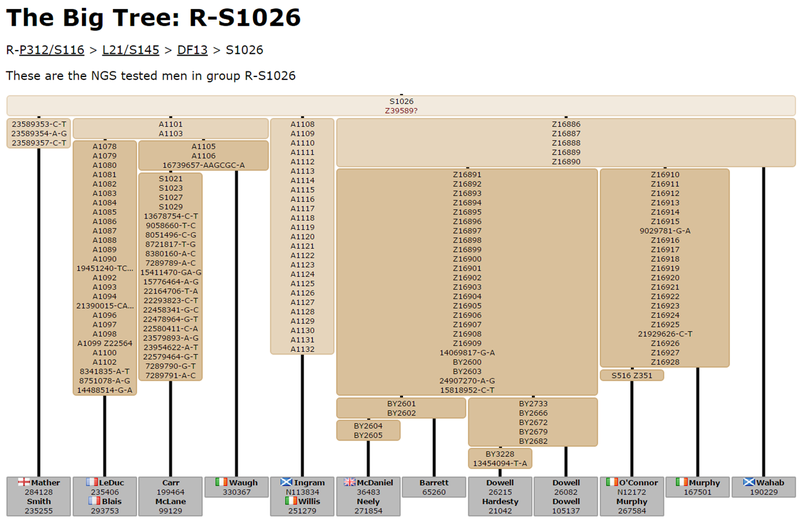 The R-S1026 chart contains many blocks or boxes that group newly discovered SNPs. At this point we believe we have the blocks in the correct chronological order of their appearance. However, we have yet to sort the SNPs within boxes into their correct order of appearance. And more remain to be discovered. Other haplogroups are in a similar state of discovery and growth. The SNP tsunami shows no sign of receding anytime soon.